As the talent wars endure, companies continue to up their game as it relates to overall perks and benefits and especially as it relates to wellness related ones. 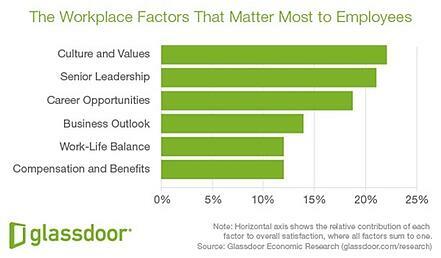 According to a Glassdoor survey, culture and values rank the highest as the workplace factors that matter most to employees. This is why wellness benefits continue to expand; they show that employers care about the well-being of employees and value them as individuals, inside and outside of the workplace. In the spirit of great wellness benefits, check out these amazing and real employee wellness perks at leading companies across the globe. Despite the amount of stress many individuals experience trying to assemble IKEA products, the Swedish furniture giant bends over backwards to relieve the pressures of raising a newborn baby. The company offers up to four months of paid parental leave to both full-time and part-time employees who have at least one year at the company, regardless of whether they work at a retail store or the corporate headquarters. Rated as one of the Best Places to Work, Bain holds an annual three-day "World Cup" interoffice soccer tournament every year and invites employees from all of its global offices to participate. It is widely known that caregiver benefits help relieve the pressures of supporting loved ones for numerous employees. These benefits usually apply to human loved one, but Scripps Health is taking these benefits to the next level. The company’s interest in their employees' well-being extends to even their pets with access to health insurance for cats and dogs. The ticket seller and concert promoter also promotes good health by offering a monthly $60 wellness stipend, which can be put toward anything from gym memberships to juice cleanses. For those organizations that want to tie wellness stipends to attainable goals or verified usage, using a platform like Wellable is a great way to make sure gym reimbursements don’t go to waste. Individuals who prepare home-cooked meals tend to eat better and live healthier lives. Whole Foods, which is known for its pricey produce, offers a 20% discount to all employees, including part timers, so they can have access to fresh fruits and vegetables for some delicious home cooking. Amazon offers two programs for new all parents, regardless of whether they work in the corporate office, customer service, or fulfillment center. The first program, Leave Share, allows employees to share paid leave with their partner if the partner's company does not offer paid leave. The second program, Ramp Back, gives new moms more flexibility easing back into work.